During Event Horizon, the global summit on Blockchain technology in the energy sector, startups showed how they can solve real world problems in the energy sector using the decentralized technology. If you are not familiar with blockchain yet, we recommend watching this short video from the Institute for the Future (IFTF) explaining the basic features of the technology in just two minutes. Blockchain projects moving beyond the hype? There has been a lot of noise and mystification around the word “blockchain” for the last years and months. Many people are fascinated by the idea of decentralization and “cutting out the middleman”, but only few people really know what to do with blockchain. Bitcoin and the revolutionary distributed fundraising tool, the Initial Coin Offering (ICO), mostly conducted via the Ethereum blockchain, seem to be the most common use cases so far. But is blockchain a “hammer looking for a nail”? Are companies uselessly spending time and money to investigate what the technology could mean for them and which impact it could have? We believe that beyond the hype, the scams and the “non-rational” token gambling, there is much more to observe these days. We see people working hard and striving for solving real-world problems. An increasing number of entrepreneurs with good experience in developing products and understanding market and customer needs are coming together with technology experts to deliver on the promises of the last year. Nonetheless, the technology is still very early (see Gardner Hype Cycle), and companies start running pilots to prove the applications’ values. In the energy sector, the Energy Web Foundation (EWF), founded by Rocky Mountain Institute and Grid Singularity, is focused on accelerating blockchain technology’s development and adoption. Currently, more than 30 companies (amongst them utilities, research companies and startups) are contributing to the EWF and Tobalaba –the Energy Web’s test network. They are “testing and scaling diverse use cases including transactive energy, microgrids, community solar, renewable energy procurement and trading, electric vehicle charging, and demand response” (see whole update from April here). The innogy Innovation Hub is happy to be part of this journey as an EWF affiliate. The whole list of affiliates can be found here. (1) The first one is RIDDLE&CODE, an Austrian startup founded in 2016. The self-appointed “blockchain interface company” is convinced that the relationship between humans and machines (that is IoT devices like your smart home system, but also heavy machinery in manufacturing) will change drastically in future. Through the increasing autonomy of machines, delegation of human mandates to machines (a.k.a. allowing a machine to do certain things on behalf of its owner) becomes possible. However, for this to work, a machine will need to be able to identify itself in order to act autonomously (with other devices) in the system. The first important steps are therefore to ensure a secure data transmission from the devices to a blockchain (via crypto chips) as well as to create way for managing the identity of machines. These solutions could be applied to IoT, AI, Supply Chain and Industry 4.0. During Event Horizon, Álvaro Mier, CCO of Riddle&Code, presented his startup’s work on the energy field. Together with EDP, a Portuguese utility company, Riddle&Code ran a pilot in Brazil where they put the net metering (reconciliation) process for energy on the blockchain. Firstly, they created a so-called “digital twin” of the smart meter at the energy generation sites using crypto tags (a very small non-removeable piece of hardware). Then, a copy of all energy production data was stored on the blockchain (and was additionally stored centralized in the EDP database). On the energy usage side, a crypto tag was placed on the meter as well. Verification of the energy consumption was done by taking a photo of the meter –thereby scanning the crypto tag on the meter. Furthermore, the customer had to type the consumption data into the app, which was then sent to the blockchain. Subsequently, reconciliation happened. This pilot shows how the process of net metering could become more efficient (less labor intensive) and more secure, using crypto tags and a blockchain database. Riddle&Code is also working on numerous other use cases for its crypto chips that can be attached to any object or machine. (2) Second up is FlexiDAO, a promising startup founded in Barcelona in 2017. FlexiDAO is part of the EIT InnoEnergy Highway Acceleration program and aims to “beak the barriers of distributed flexibility” by managing (many) small loads to balance the grid. During their pitch at Event Horizon, Simone Accornero, CEO and founder of FlexiDAO, gave an overview of how they can help tackling the challenge of an increasing amount of unpredictable energy consumption in the grid. Furthermore he stressed that they are “a demand-response company, which happens to use blockchain –not the other way around!” Luckily, this is also reflected in their team composition, a great mix of experts from both the energy and tech sectors. So, what does FlexiDAO exactly do? FlexiDAO helps grid operators to balance the grid by enabling small, distributed flexible loads (e.g. electric vehicle charging stations) to participate in flexible grid balancing. 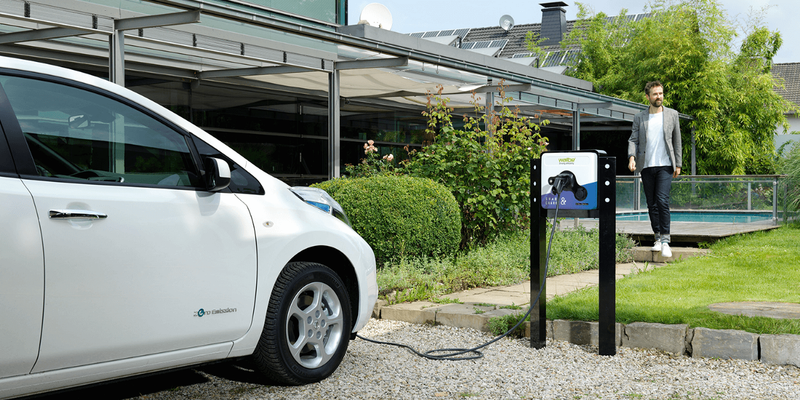 In their solution, smart EV chargers can be connected to a distributed cloud-based DER management service, that steers the devices. By “using blockchain, we can efficiently and cheaply aggregate separate loads (EVs) turning them into one single flexible load that can be offered as a service to distribution grid operators or traded on the flexibility markets”. Real-time cash & token rewards are offered to the operators of the DERs (Distributed Energy Resources). FlexiDAO works with a combined blockchain infrastructure, leveraging the ethereum public chain as well as the Tobalaba chain provided by the Energy Web Foundation. (3) Last but not least, one of our very own portfolio companies, Share&Charge (an initiative by MotionWerk), conquered the stage. Share&Charge is developing a decentralized electric vehicle charging protocol to solve problem of EV adoption and ease of use. They aim to enable seamless and secure (smart) charging of electric vehicles by creating a cross-operator and cross-country “roaming” network for charging services. Share&Charge already has a good track record of bringing blockchain to real customers. They launched a peer-to-peer (P2P) charging solution (“Airbnb for EV charging”) with 1000 customers on the Ethereum main-net last year. This year, they will take their learnings to develop the roaming network for EV charging. They already piloted a roaming solution with seven charging network providers across Europe and are currently running another charging pilot in the UK. We recognize that blockchain technology and most of its applications are still in its infancy, however, it is great to see some progress. For instance, projects moving into the right direction, consortia forming and companies eagerly working on solving problems in the energy sector with a “non-traditional” approach (compared to the “average” corporate utility thinking) are great examples of this. There’s much we are looking forward to in the future when it comes to blockchain. It’s a matter of natural selection: while most of the current initiatives will fail, the remaining startups will professionalize, grow, and eventually compete with “state-of-the-art” energy market solutions. For the customer, this could mean a move towards customer centricity, transparency, ease-of-use and freedom of choice. We remain hopeful and are excited about what the future of blockchain and energy will bring! 👏🏼 If you enjoyed reading this piece leave us a clap or comment below. We are curious to hear your thoughts! 📩 If you are a startup working on a blockchain, IoT or energy venture, please feel free to contact us!